Think you know everything there is to know about the Super Bowl? So much so that when your team is in the Red Zone, your freinds think you know what's the right play? If so, then this app will let you prove it! Tons of questions and a variety of game modes will keep you guessing and entertained for hours. Quiz yourself or quiz other die hards! 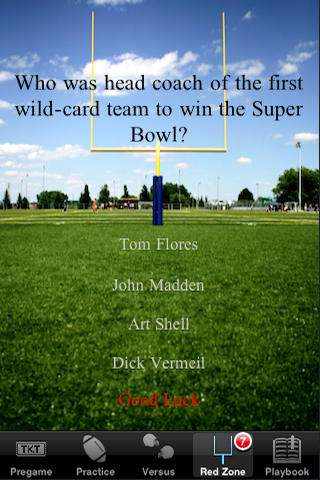 Red Zone Super Bowl is the definitive Super Bowl trivia game. 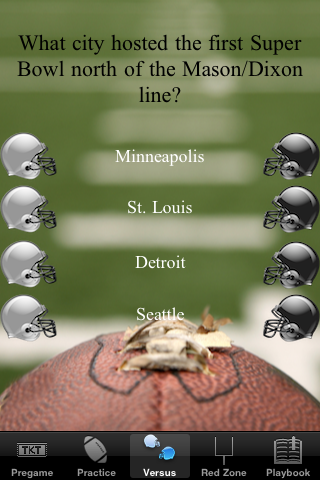 It is based on the player, team, coach, stadium and game details surrounding the Super Bowl. 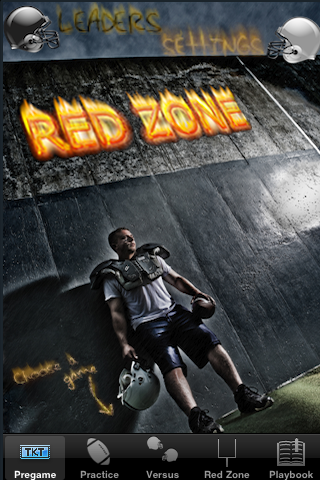 Red Zone has more questions and game modes than any other football-based trivia game. With nearly 500 questions and the 2-player versus mode, you can exhaust your knowledge and compete head to head against other fans. Please read below to discover the various game modes and play options. Practice mode lets get ready for the big game. Like practice, you are given a set number of days to prepare. As you train (by answering) successfully, your screen will progress from pitch black to the red zone - and you'll be ready to become a playmaker. Good luck! Choose your side & play against a friend! Hold the device between you and race to choose the right answers. Each team is provided with a set of helmets along each side. Press your helmet next to the right answer before the other team and win the point. But, if you are wrong, you lose a point. Both teams are the good guys and deserve to shine! Like any time you get into the Red Zone, it’s sudden death. You are trying to score and the stakes are high. If you make one mistake, you are finished. You have 20 seconds for each question, the countdown is on. Correctly answering Bush League questions give you 10 points, College Ball gives 25, and The Pros 50. To earn the Coach’s respect and win the game, you must reach a certain point level. Beware! Your quarterback getting sacked costs half your points but a favorable ref doubles your score. Go Big or Go Home. •	New questions will be released with future updates. If you have a good question, send it to our support and it will be considered! •	Choose your game options and set your player and account details in Settings. •	Set your desired question level: Bush League, Player, Coach!, or All. •	Set your desired question categories: General, Outside The Lines, Records, or All. •	Sleek interface beautifully designed from the ground up for the iPhone and iPod Touch. •	Personal leader boards to save your best scores. •	After the big game this year, this years questions will be added. •	Facebook integration! So act now, while Red Zone is still at the introductory price. Once launched, you will be able to post feed messages with your high scores and compete against your friends. •	Engaging sound effects and musical score capturing the football universe.